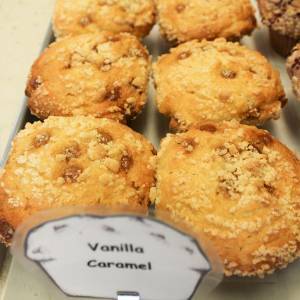 For this muffin, which their is nothing vanilla about, Frank went to Mexico. Once there he lived within a traditional Aztec village where he learned to grow, harvest, and process vanilla beans straight from the vaina. This precious gift from the gods is balanced harmoniously with complimentary caramel. And combined with the marvels of modern science, brought to molecular perfection through the caramelizing process. This muffin is the perfect mix of the primitive and the modern: it feeds the spirit and the intellect!